So, it's 2014. This is the year I've been waiting for. My vision-board-come-true year. 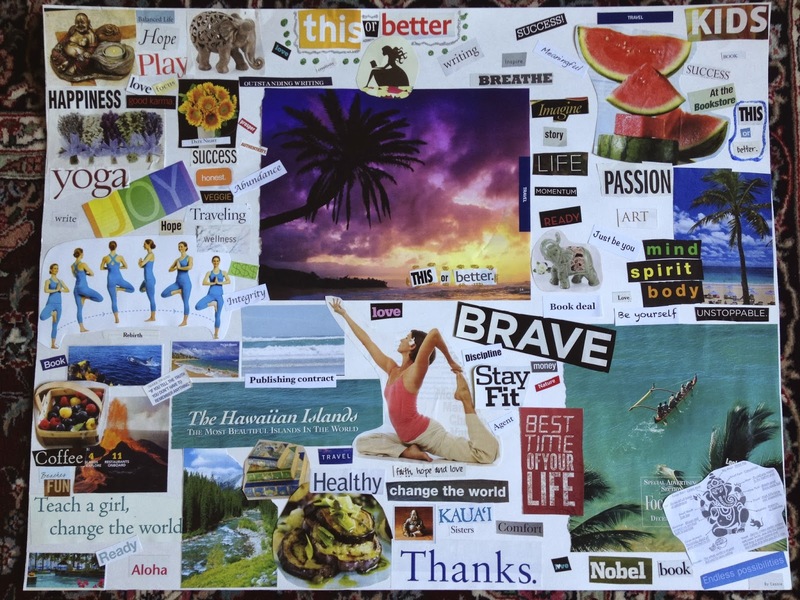 Just over a year ago my sister, dad, step-mom, kids, and I got together with a stack of poster boards and a heap of magazines to make our first vision boards. Mine sits on my desk just behind my computer, where I see it every day as I work: Hawaii images, yoga poses, chocolate, coffee, lavender bouquets, and Ganesha, the patron of letters, who keeps me company as I write. Scattered throughout are words like breathe, play, success, wellness, and joy. I put all of my dreams up there, too: agent, publishing contract, travel, balance. And as the year went on I had to keep adding new words, because the wishes all started coming true. I got an agent. I got a publishing contract. I got two trips to Hawaii. I found balance. The board, now framed, still sits in front of me at my desk, a reminder of how far I've come, how much possibility still lies before me. I've always been a pragmatic dreamer, which means that I daydream up these outlandish notions of where my life could go, all the while working like hell to make a dent in whatever pile of work I've given myself for the day. I rarely need to be pushed by anyone, I drive myself harder than anyone else ever would. This is a great attitude to have when trying to get published. Keep dreaming that it's possible, but never lose focus on the blank page in front of you. Keep coming at it until you get it right. Most days I still have the same attitude. I am aware that I have a novel coming out in six months, which is so ridiculously exciting that I can barely sleep if I think about it too much, but I also know that if I spend too much time thinking about it I'll be too distracted to write more novels. And I want to write more novels. Tons of them. It also helps to have young children. Nothing keeps you humble like two kids doing cartwheels and walkovers in your office, asking an endless stream of questions about when they were babies, how exactly you chose their name, why there are so many irregular verbs in English, whether they can have a pet chinchilla. My seven-year-old likes to read my writing notes over my shoulder and question every one of them: "But why does she want to move? I think if she liked her house she wouldn't want to leave. Maybe you need to write something about why she doesn't like her old house anymore." My eight-year-old sometimes comes downstairs at midnight and tells me to go to bed. She knows as well as I do that sleeping in is not part of a single mom's life. My girls have been off school a lot lately. A week for Thanksgiving, a week in Hawaii to celebrate my book deal, then two weeks off for winter break. I haven't gotten a lot of writing done in the past six weeks, and I miss it. But I've gotten to spend a lot of mornings with my girls, sipping coffee while watching them play. They have vivid imaginations and create elaborate games that involve singing, dancing, drawing, creating new forms of currency, granting wishes, punishing evil-doers, and traveling the world. They are my blank page, too. I already know that this is going to be a great year. The one when I finally see my name on the cover of a novel. The one when I finally take the leap to author. My girls will continue to grow taller and master new gymnastics skills and learn new things and wake me up way too early on Saturday mornings. I expect it to be my best year yet. 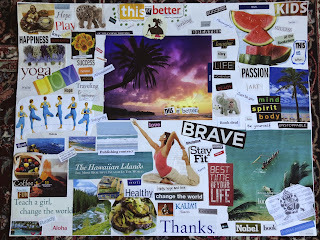 Maybe it's time to make a new vision board, and dream up some even bigger dreams.